What will Starbucks look like in India? Coffee giant Starbucks from Seattle (home of Microsoft) finally enters India through a joint venture with Tata. Teenagers (including those who have never been to Starbucks before) in India were looking forward for Starbucks . Initially they will open their cafes only in Mumbai and Delhi. Bangaloreans will be denied of Starbucks in 2012. Starbucks cafes will now compete with Costa Coffee, Cafe Coffee Day and Barista in India. Together these players control a coffee cafe market estimated at over Rs 700 crore (approx $145 m) a year [via India Today]. Starbucks has 17,000 cafes across 50 countries, opening new 2-3 stores everyday. Anyway the reason for me to write about Starbucks is not about the commercials. There are serious business journals who have already covered it. 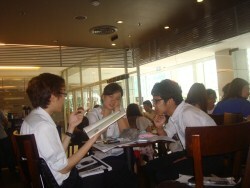 In Bangkok you will see most coffee cafes, especially Starbucks, being filled up by students. Guess they come for free wifi but I have never seen students studying so seriously in coffee cafes. Wonder what the crowd in Starbucks India would look like?